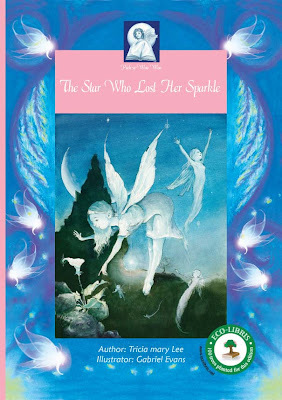 Pick-a-Woo Woo's new book, The Star Who Lost Her Sparkle, is going green with Eco-Libris! We are happy to announce a new collaboration with our partner, the Australian publishers Pick-a-Woo Woo, on a great new green children's book that was just released: The Star Who Lost Her Sparkle. Sprinkle here and Sparkle there. We work with love This cosmic fairytale of a sick star and her sad people is a story we can relate to with our planet today. Luckily, the Fairies from the Great Medicine Star work their wonderful healing arts for happiness. A simple meditation is provided to help spread the sparkle. A powerful message that reaches out to young and old who care about our beautiful planet Earth.
" I have always loved writing. I love it as an art form for it's creative expression, as a communication tool for reaching across cultures and continents, as a power tool to inspire the heart and transform our way of thinking." "The Star who lost her Sparkle" is my first published children's book and it was written in England, where I have a strong Celtic bloodline, hence the fairies!!! " A self-confessed gypsy, Tricia mary, [who is proud mum to two big men, Tom, a photographer and James, an artist,] currently lives with her husband of 27 years in the beautiful southern forest region of West Australia in communion with this wonderful earth. Her work journey spans teaching special needs students in the early childhood age range in the UK to literacy consultant in the Kimberley [ far NW Australia ], from practicing various healing modalities to training volunteers in Tender Touch Therapy for work with the aged and especially those with palliative care needs. In 2010 she received the ‘Volunteer of the Year' award for this work.